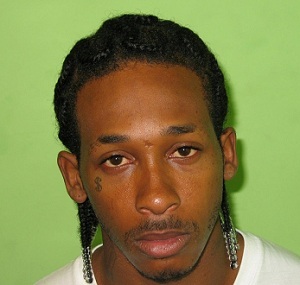 Escaped prisoner Alvone Maybury was caught minutes ago this afternoon, hiding in a back shed in the exact same area of Glebe Road that the Police had searched for hours on July 23. He was taken, under heavy guard, to Hamilton Police Station at approximately 1:30pm. Two arrests have been made in connection. The 24 year old, who dramatically escaped from Prison Officer’s custody outside of Magistrates Court on July 13, appeared to be updating his Facebook while on the run, and at one point had promised to turn himself in. Mr Maybury, who managed to elude authorities for 13 days, was facing three firearm charges [possession of firearm and ammunition and discharging a firearm in December 2009] when he bolted for freedom outside Magistrates Court. As of present Police are still on the scene at Glebe Road [photo], and have the road blocked off again. We are on that scene, and awaiting an official police statement on the matter now. Updates to follow…. Update 1:55pm: Police state that at 1:20pm a special Police Task Force visited a residence on Glebe Road, Pembroke and went to a back shed where Maybury was taken into Police custody without incident. The Police further say that also at the residence at the time were another male and a female who are also in custody pending a court appearance. Update 2:37pm: We are at the exact house he was arrested. We are talking to some of the occupants of the home now, and they deny all knowledge of Mr Maybury being here. The shed is located behind their home. Eyewitnesses describe Alvone has “not being in disguise”, and the Police literally surrounding him as they took him away. They said Alvone was calm, no shouting or anything of that nature. Update 3:17pm: Photo of the shed he was found in is here. [We have cropped the photo to show only the shed as per the request of area residents] We were told it is a one room shed which measures 10×10, for a total of 100 sq feet. Update 3:19pm: Further eyewitnesses tell us that one man was brought out, the female was brought out, then Alvone. They say Alvone was “circled” by Police, all of whom looked bigger then Alvone. They said Alvone was surrounded by Police to the extent that they could not even see what he was wearing. They said it was “no drama”, and he was taken away and placed in a car. Around 1:20pm today, Police apprehended escaped prisoner 24 year old Alvone Maybury in The Glebe Road/Secret Lane, Pembroke area. Mr. Maybury was taken into custody without incident along with another young man and a young woman who were found with him at the time. A court appearance for Mr. Maybury is anticipated in due course. The Bermuda Police Service would like to thank the members of the joint Police & Corrections special task force who worked tirelessly to recapture Mr. Maybury. Acting Detective Chief Inspector Robert Cardwell, who headed up the joint special task force, indicated that the strong partnership between the Bermuda Police Service & the Department of Corrections in particular, along with some assistance from the public, resulted in the peaceful conclusion of this matter. Now let’s see how serious we are about following through on the law as far as the ‘other two arrests’ are concerned. I don’t know about anyone else, but I think would know if someone was in my shed for any length of time – unless of course, he was hiding there from somewhere else……..so the occupants are not the man and woman they have taken into custody then…..that’s bizarre……I wonder where they came from?!!!! Oooh I can’t wait to hear all the news! LOL!! I had the same vision! The Andy Griffith Show rings a fine bell here…………………….Looks like Barny and Goober finally figured it out. Maybury is a safer town now. Hit them for a six……………..no bounderies…and no water breaks…unless Westgate is just another Watergate……………………..
A man and a woman were also inside? Hmmm wonder whY and what for. This should be interesting news to come for some time. I hope the residents of the house are being investigated. How could they not know he was in there? BS. Harboring a fugitive. this has to be the funniest fugitive story ever! he was hiding on secret lane.. that should be the first place police should of looked thru lol… Bermuda Police; such a joke!